The deep Earth mineral magnesiowüstite can transmit infrared radiation at normal atmospheric pressures, but loses this ability when squashed to over a half million times the pressure at sea level. 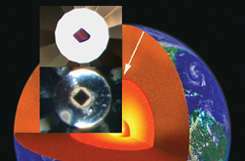 Minerals crunched by intense pressure near the Earth's core lose much of their ability to conduct infrared light, according to a new study from the Carnegie Institution's Geophysical Laboratory. Since infrared light contributes to the flow of heat, the result challenges some long-held notions about heat transfer in the lower mantle, the layer of molten rock that surrounds the Earth's solid core. The work could aid the study of mantle plumes--large columns of hot upwelling magma believed to produce features such as the Hawaiian Islands and Iceland. Crystals of magnesiowüstite, a common mineral within the deep Earth, can transmit infrared light at normal atmospheric pressures. But when squashed to over half a million times the pressure at sea level, these crystals instead absorb infrared light, which hinders the flow of heat. The research will appear in the May 26, 2006 issue of the journal Science. Carnegie staff members Alexander Goncharov and Viktor Struzhkin, with postdoctoral fellow Steven Jacobsen, pressed crystals of magnesiowüstite using a diamond anvil cell--a chamber bound by two superhard diamonds capable of generating incredible pressure. They then shone intense light through the crystals and measured the wavelengths of light that made it through. To their surprise, the compressed crystals absorbed much of the light in the infrared range, suggesting that magnesiowüstite is a poor conductor of heat at high pressures. "The flow of heat in Earth's deep interior plays an important role in the dynamics, structure, and evolution of the planet," Goncharov said. There are three primary mechanisms by which heat is likely to circulate in the deep Earth: conduction, the transfer of heat from one material or area to another; radiation, the flow of energy via infrared light; and convection, the movement of hot material. "The relative amount of heat flow from these three mechanisms is currently under intense debate," Goncharov added. Magnesiowüstite is the second most common mineral in the lower mantle. Since it does not transmit heat well at high pressures, the mineral could actually form insulating patches around much of the Earth's core. If that is the case, radiation might not contribute to overall heat flow in these areas, and conduction and convection might play a bigger role in venting heat from the core. "It's still too early to tell exactly how this discovery will affect deep-Earth geophysics," Goncharov said. "But so much of what we assume about the deep Earth relies on our models of heat transfer, and this study calls a lot of that into question."